YolanDa welcomes didgeridoo player Chris Holland. 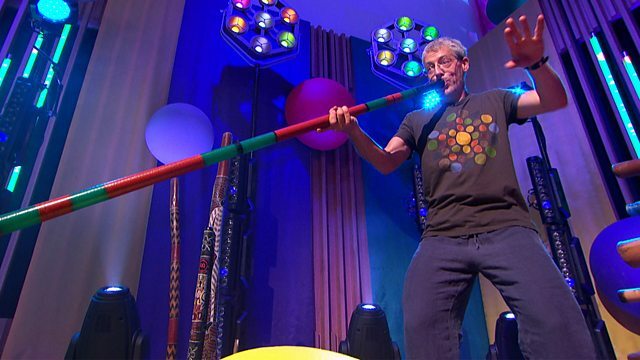 In the Fact Jam, we find out more fun facts about the Didgeridoo. YolanDa kicks off the show with “Something ‘Bout That Noise”, a song all about dynamics in which the Band Jammers must crouch down low then jump up high when the song goes from quiet to loud. YolanDa then welcomes didgeridoo player Chris Holland. He shows off his beautiful collection of didgeridoos – hollow tubes from Australia - and some of the artwork from nature that adorn them, before showing everybody how you can make sounds through a didgeridoo. In the Fact Jam, we find out more fun facts about the Didgeridoo, including how termites traditionally hollow out bits of wood to make them, and how players can sometimes play continuously by breathing in through their nose whilst they breath out through their mouths. A short film features some music and art-loving children as they listen to music and draw what it makes them think of. The music is a spooky sci-fi track and illustrator ‘Jarvis’ helps them along with the final picture. Finally, Chris joins YolanDa and the Band for a special Band Jam inspired by the Kookaburra sounds of the didgeridoo.